I imported I Am Setsuna earlier this year when it first came out in Japan, though I never got around to playing more than the first couple of hours. Having now played the English version, I’m glad I didn’t play much of the import, because with my cursory understanding of Japanese, I wouldn’t have been able to really see what this game has to offer. I’d have played a fun, cute, classically-inspired JRPG with beautiful presentation, but I wouldn’t have been able to appreciate the depth and nuance that it offers. Make no mistake—this is a complex, insightful game that goes so much further than its surface-level retro inspiration. It’s absolutely a love letter to the JRPGs of decades past, but it’s the kind of love letter that serves as a reminder of why those games are so beloved to begin with, rather than simply emulating them. 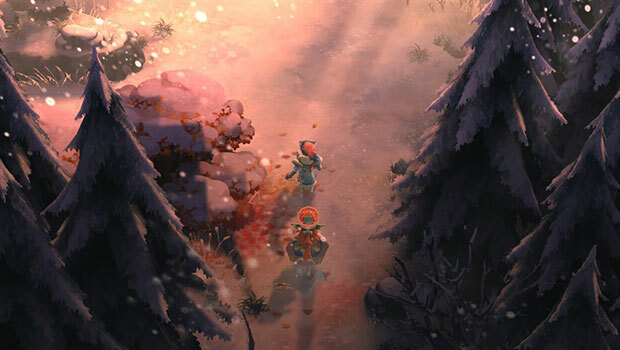 I Am Setsuna is a game of sorrow and loss, but also of hope and bittersweet nostalgia. It follows the eponymous Setsuna as she journeys—knowingly—to her death, as the latest chosen sacrifice in a thousand year old ritual to keep the world at relative peace from monsters. That’s certainly a heavy burden to bear, but this is constantly contrasted with the beauty of the world and just what it is that she’s sacrificing herself for. As solemn as the pilgrimage is, there’s a pervasive sense of hope for the future underscoring it. Such is her faith in the inherent goodness of people, and even of monsters, that she frequently puts herself and her party at risk by opting to talk first and shoot later. She’s the White Mage archetype—the Rosa, the Yuna, the Garnet—but in a game that has just the right tone and emotion to make such a character flourish. Setsuna isn’t alone in her pilgrimage; rather, she’s accompanied by a group of companions that—in typical JRPG fashion—grows over the course of the game. In keeping with the general theme of bittersweet sorrow, all of these are troubled individuals grappling with their own demons. Each ally has their own little arc and, as fantastical as they are, they’re delivered with such humanity and grace that it’s hard to not get swept up and personally invested. In fact, that’s something at work throughout the game at large. Setsuna’s journey is a grand, world-spanning one, but I Am Setsuna feels like an intimate, personal adventure rather than one that’s epic and grandiose. More than any of the classics it draws on, it reminds me of Child of Light in its ability to make an epic fantasy feel personal and human. I’ll put this down almost entirely to presentation. The soundtrack is made up entirely of piano performances—and absolutely amazing ones at that—giving the whole game a feeling that’s not so much cinematic as it is akin to a small-scale stage production or even a family gathering. This is reflected in the art direction as well, with its muted colours and painterly finish. The whole game feels like a sumi-e painting, not necessarily in style—though there are hints of that, especially in the world map—but in tone and emotion. I Am Setsuna has a remarkable sense of place that, again, contributes to its intimate feeling. As you walk navigate the world, be it within a town, a dungeon, or the world map, the snow crunches underfoot and a trail is left in each character’s wake. In some places, the snow is thick, up to the waist; in others, it’s a light dust across an ice floe. This is hardly a major technical achievement in 2016, but I’ve never seen it used as well as this. The world feels tangible as you explore it. Even rugged up and with the heater on, I often felt physically cold while playing just from the sound and visual effects of the game’s snowy landscape. So, I Am Setsuna certainly has an identity of its own. At the same time, it’s a tribute to the games that came before it and the JRPG genre as a whole. The premise of a sacrifice’s pilgrimage to bring a temporary peace to the land is a clear nod to Final Fantasy X, even if it goes in a very different direction towards the end. The battle system is lifted almost wholesale from Chrono Trigger, and goes as far as including moves like X-Strike and Cyclone. Snippets of music channel Final Fantasy’s iconic victory fanfare. Though they’re not called Behemoths, the final dungeon is home to powerful horned monsters that cast Meteo upon death. 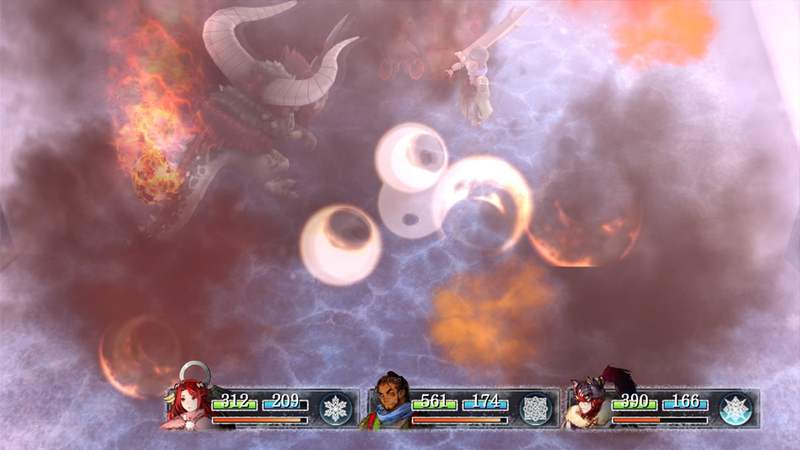 You’ll even see the the “waning moon” animation of Final Fantasy IV’s Holy and Flare spells in the visual effects of some attacks in I Am Setsuna. This is all very deliberate. As I said, this game is a celebration of the JRPG, but it’s a wistful, nostalgic homage rather than simply a “retro-inspired” modern game, and all these very specific points of reference are fundamental to this. 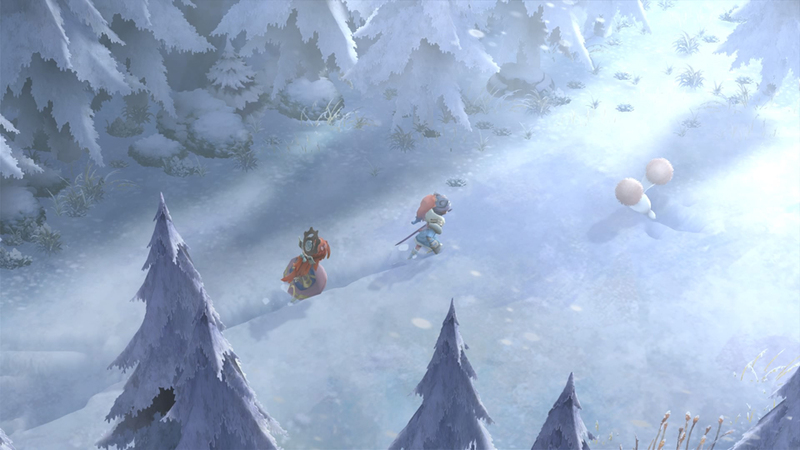 They allow I Am Setsuna to call on sentimental memories of specific games, even as it creates such memories of its own. That bittersweet, hopeful melancholy doesn’t just underpin the story and presentation, but even the most mechanical aspects of the game. The way Tokyo RPG Factory have managed to weave this thread through every facet of the game is impressive, to say the least. With this golden age inspiration come the problems of those classic games, too. Sparse save points, the bane of my existence, are your only means of saving when you aren’t on the world map, and if you get killed, you bet you’re going back to your last save. If you haven’t saved for a while and suddenly find yourself getting run around by a tough boss, or even a regular foe that’s buffed itself to the point of one-shotting your party, you’re in for a world of frustration. Bosses, though vaguely interesting in their design, tend to be difficult through sheer strength, so don’t be surprised if you have to stop and grind levels every now and then. Here’s the thing, though: these weird, seemingly archaic designs serve a noteworthy narrative purpose that I won’t give away because you really need to experience it for yourself. Suffice to say, I Am Setsuna can get frustrating—infuriating even—but by the end of the game, that emotional gauntlet will make sense. There’s a subversion of common JRPG annoyances that’s quite brilliant, really. This is why I say that I Am Setsuna is so much more than just a classically-inspired game. It’s a celebration of the genre through nostalgia and homage, but also through clever and insightful critique. That, frankly, is the greatest love letter one can write to those long-gone days for which we wistfully yearn. I Am Setsuna is developed by Tokyo RPG Factory and published by Square Enix. It’s available now for PlayStation 4 and PC. A PlayStation 4 press copy was supplied by Square Enix for this review.